Tugs nudge the battleship Iowa (BB 61) into place at Ingalis Shipbuilding in Pascagoula, Miss, for com- pletion of her modernization and reactivation. Ingalis Shipbuilding division of Litton In- dustries in Pascagoula, Miss., recently for completion of her modernization and reac- tivation. Avondale Shipyards Inc. performed dry- docking work and equipment removal under subcontract to Ingalis. Ingalis recently received a finalized con- tract worth more than $177-million for com- pletion of the modernization and reactiva- tion. The contract includes $39.2-million previously awarded for planning and prep- aration, drydock and prefabrication work, and procurement of long-lead time material. Systems mounts for self-defense against aircraft and missiles, air and surface search radar systems; and helicopter launch and recovery facilities. The ship's nine 16-inch guns and 12 of 20 original 5-inch guns will remain. While the Iowa contract will not increase employment at the shipyard, it will be an important factor in stabilizing current man- power levels. The work will employ some 1,500 people for about 18 months. "Returning Iowa to our Navy's Fleet will be a challenging opportunity for our em- ployees. The award of this contract reflects our company's reputation with the Navy for high quality work and schedule achieve- ment," Leonard Erb, president of Ingalis and senior vice president of Litton Indus- tries, said. November 15, 1982, and January 15, 1983 issues). 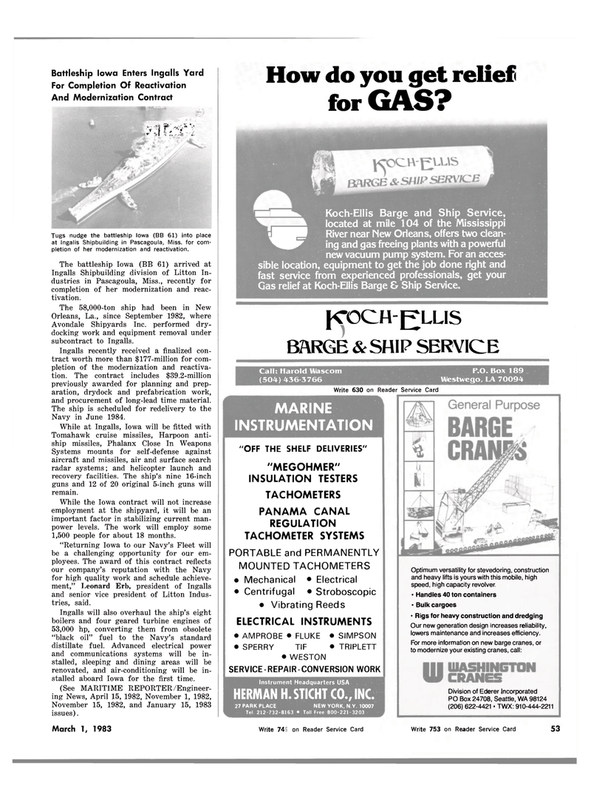 Gas relief at Koch-Ellis Barge & Ship Service. INSTRUMENTATION "OFF THE SHELF DELIVERIES" "MEGOHMER"
Our new generation design increases reliability, lowers maintenance and increases efficiency.